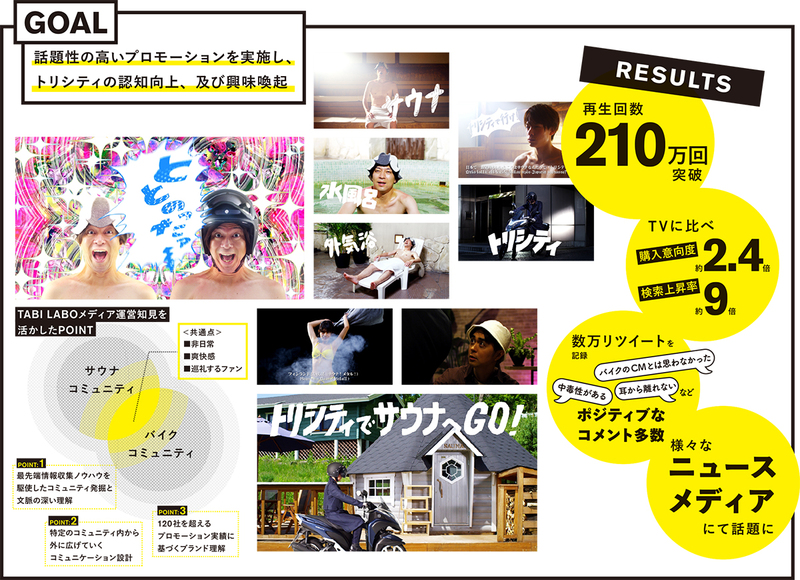 ■ Drawing on the unexpected connection between bike and sauna, the TRICITY video campaign went viral, seeing tens of thousands of tweets and over 2.1 million video views. Compared to TV ads, purchase intent increased 2.4x while search went up 9x. BRAND STUDIO highlighted the appeal of Yamaha Motor Company’s leaning multi-wheel (LMW) TRICITY vehicle in a video promotion called “Refreshed with sauna and TRICITY,” handling not only the concept and planning but also production and promotion. In Japan, motorcycles have a strong following among enthusiasts, and the client wanted to inspire both the bike fans and a community that can connect with them to spread its message. After conducting extensive research on groups and demographics that can connect with bikes, we saw that sauna had been picking up as a movement in Japan amongst 20-40-year-old males in recent years, and that they shared a lot of commonalities–both bike and sauna are about escaping the mundane, valuing a sense of adventure and feeling refreshed.